or an equivalent qualification. After a one-month evaluation period you will submit a short research proposal which summarizes the general subject and detailed goals of the thesis. Based on this proposal the thesis will be registered officially. During the following six (four, for a bachelor thesis) months you will work on the various programming tasks, literature search, data acquisition and so on as required by your project. If necessary, you can use the special equipment available at the graphics lab, including a 3D scanner, stereo projection wall, a robot arm, a 3D printer, high quality video and still cameras and other devices. Of course, during your thesis project there will always be a research assistant available who supports you and supervises the progress of the project and who can be asked for help if difficulties arise. Finally the thesis is finished by writing an approx. 80 to 100 page report (less for a bachelor thesis), giving a concluding talk about the project and the results, and by providing a CD or DVD with full documentation of the programs and other resources that have been created during the project. Below is a list of projects we are currently working on. In the context of these projects various thesis topics can be offered depending on your personal interests. Please contact the corresponding assistant (in person or by e-mail) for more information, stating which relevant courses you have taken, etc. In the context of Shape Analysis we apply machine learning and statistical methods to analyse single 3D models or whole shape collections. These methods can be used for discrimination tasks such as symmetry detection, classification or segmentation as well as generative tasks such as automatic generation of shape collections. Bachelor or Master theses can be offered in this field for various ongoing projects. 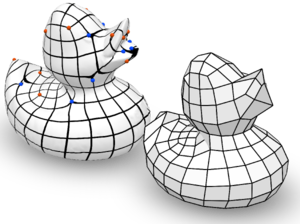 In the context of Quad Meshing we are exploring numerous ways to enhance and extend the algorithms we currently use. 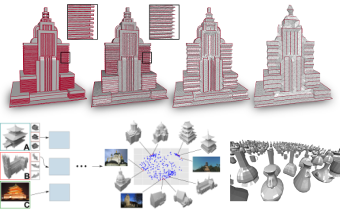 Possible directions are: better automatic detection of surface features or structures to be considered by the meshing algorithm, novel ways and tools allowing for more user influence, a more interactive workflow, intuitive visualizations for user guidance, etc.